When a baby is born, most every parent wonders “what will become of my child.” It was no different for Giuseppa and Grazio Forgione, when Francesco was born on May 25, 1887 (only 8 days after my Grandfather Bline was born) in the small farming town of Pietrelcina, Italy. Although they were poor in things, they were certainly rich in their faith and in the love of God. Even as a young boy, Francesco had already shown signs of extraordinary gifts of grace. His mother described him as a quiet child who always loved to go to Church and to pray. At the age of five he dedicated his life to God. As a young boy, he was able to communicate with his guardian angel and with Jesus and the Virgin Mary. In his simplicity and innocence, Francesco assumed everyone had the same experiences. So is this true for you? Do you communicate with your guardian angel? With Jesus and His Mother? When Francesco was born, his parents had no idea he would one day become Saint Padre Pio. They could never have imagined that the call of holiness they would pass on to him would one day grow into such a life of sacrificial love. Today (23rd of September) is the 50th anniversary of Padre Pio’s death (and my sister Ellen’s birthday, as well as our bulletin publisher’s 50th…happy birthday Cathy). Padre Pio wrote to many who struggled in their faith and continues to be spiritually present to those God connects to be his spiritual children. I encourage you to take some time to look into his spirituality and the profound trust he placed in Jesus. 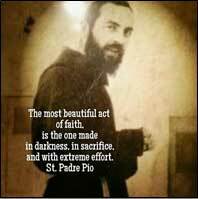 Jesus offered Padre Pio a chance to share in his stigmata (the sharing in the wounds of Christ). 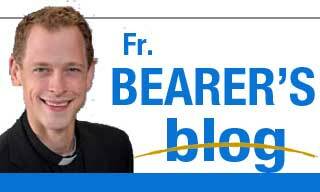 The whole idea of a stigmata is hard for most people to understand, let alone accept. But, as my first pastor (Fr. Klasinski) prophetically once said, “we all have a stigmata we have to deal with…but for most of us, nobody else sees the wounds.” May we trust in The Father’s merciful love to help us deal with our stigmata’s that will always lead us to His glory! N.B. It’s still not too late to join R.C.I.A. to learn about Catholic faith or to be a part of our fall book study, Lift Up Your Heart (10 week retreat on the meditations of St. Francis de Sales). Any questions give a call to our parish office. (This week’s blessings: Happy Birthday Mrs. Stephanie Suso, LB, Dorothy Koopmeiner, Susie Naragon & a blessed anniversary to Regina & Jim Merle…and don’t forget the feast of the Archangels is Saturday the 29th).